In 2007, NOx and NMVOC emissions dropped below target values while SO2 and NH3 emissions remained below 2010 target values. This caused a reduction in the emission of acidifying substances, ozone precursors and particulate matter. NOx is the only substance that is present in all three groups with a substantial share. The largest source of NOx emissions is transport followed by energy and heat production. Environmental Agency of the Republic of Slovenia; Jožef Stefan Institute, 2009. There is no quantified objective for CO and PM10 emissions. A revision of Directive 2001/81/EC on National Emission Ceilings for Certain Atmospheric Pollutants is being prepared. The amended Directive will set new targets for SO2, NOx, NMVOC, NH3 and PM2.5 emissions for the year 2020. For all air pollutants, energy-related emissions decreased in the treated period. This is especially true for SO2 emissions that were 93 % lower in 2007 than in 1990, whereby approximately half of this reduction was achieved by the year 2000. The reason was the installation of desulphurisation devices on thermal power plants and the use of fuel with a lower sulphur content. In 2007, the emissions of the Šoštanj Thermal Power Plant reduced by 18 % due to flue gas exhausts from units 1-3 being connected to the desulphurisation device of unit 4. In 2007, energy sources contributed 92 % of total SO2 emissions. 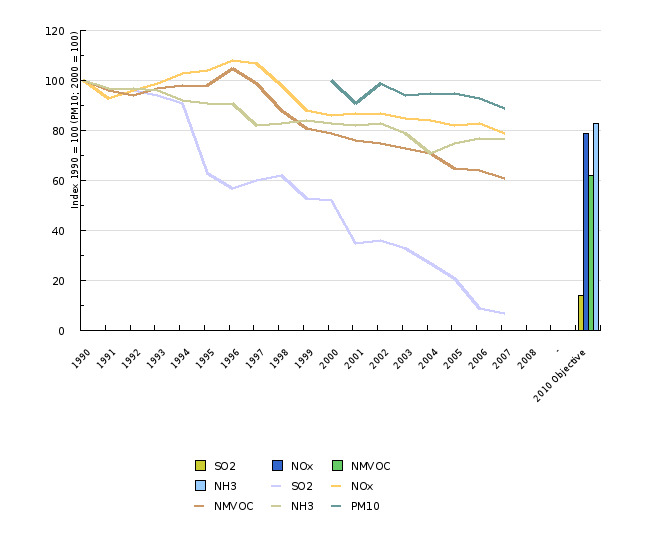 Emissions of non-methane volatile organic compounds substantially reduced as well, being 51 % lower in 2007 than in 1990. This reduction was predominantly caused by the use of catalytic converters for the after-treatment of motor vehicle exhaust gases and a substantial increase in the share of diesel fuel in total motor fuel consumption. In 2007, emissions reduced by 4 % due to reductions in industry and transport-related emissions. In 2007, the share of energy-related emissions amounted to 59 %. The smallest reduction was evident in NOx emissions (by 21 %). With regard to the year 2000, these emissions reduced by 9 %. This reduction was caused by European standards defining the permissible content of substances in the exhaust gases that are met by using catalysts and implementing primary measures in thermal power plants. On the other hand, industry-related emissions increased (due to including emissions from the construction sector – construction machinery, in the year 2000 and economic growth in 2005 and 2006) as well as emissions in the household sector that increased due to a growth in the use of liquid fuels (until 1999). 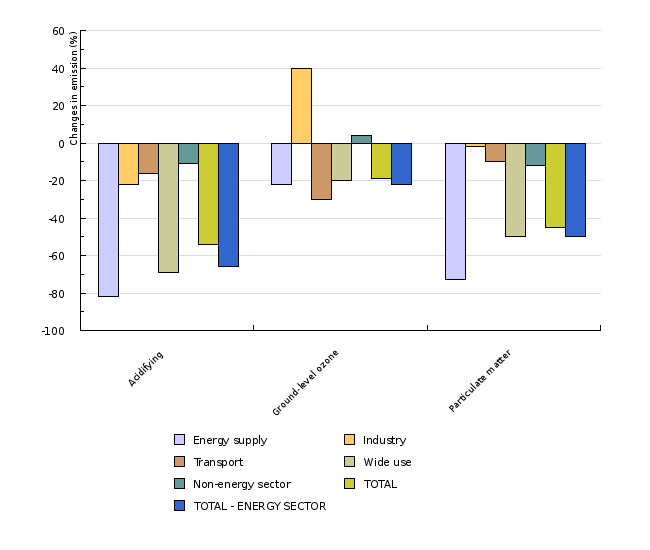 In 2007, a 5 % reduction in emissions was noted due to reductions in energy consumption in the industrial sector (natural gas) and in wider use (fuel oil). All NOx emissions are energy-related. In 2007, 96 % of ammonia emissions (NH3) originated in agriculture and the remainder in transport. 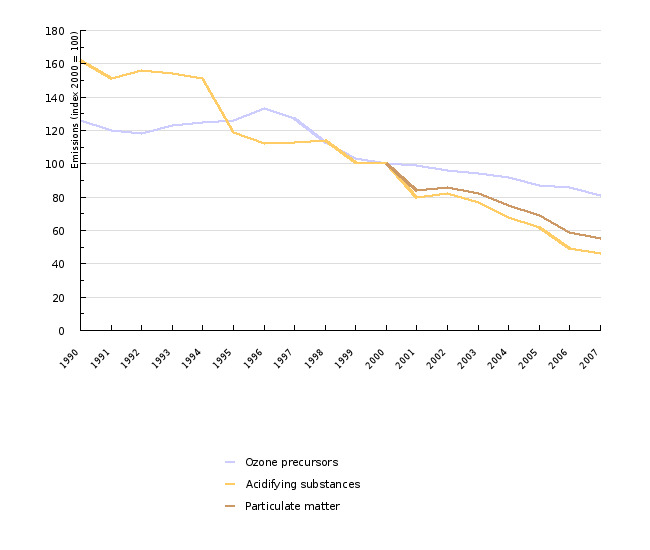 Transport emissions have been increasing due to a higher number of cars with catalytic converters. Since the year 2000, these emissions increased by 11 % and by 0.4 % since 2007. Particulate matter with a diameter of 10 μm or less is also an atmospheric pollutant but its records were set up only in the year 2000 so there is no quantified objective for its reduction. Following a chequered trend until 2003, energy-related emissions slowly reduced between 2004 and 2006 (at an average annual rate of 2.3 %), while a more substantial reduction was evident in 2007 (7 %). In 2007, energy-related emissions represented 83 % of total emissions that stood at 7.4 kt. Carbon monoxide (CO) emissions, which are fully energy-related, were substantially lower in 2007 than in 1990 (61 %). This was due to swift reductions in transport emissions after 1996 (due to European standards), as transport is by far the largest source (almost 70 %). In 2007, they amounted to 99.3 kt. In 2007, total emissions (non-energy related and energy-related) amounted to, for SO2, 14.2 kt, which is almost 13 kt less than the 2010 target; NOx 44.6 kt (0.9 % lower than target emissions); NMVOC 39.3 kt (1.7 % less than the 2010 target) and NH3 18.5 kt (7.5 % less than target emissions). The year 2007 was the first year when emissions of all substances in Slovenia were below 2010 target values. We need to be aware however, that targets for NOx emissions can still be jeopardised, as the consumption of liquid fuel in transport is rapidly growing, while liquid fuel consumption in wide use increased in 2008, which means that growth in transport will no longer be offset by reductions in wide use. Detrimental environmental effects of air pollutants can be classified into three groups: acidification and eutrophication that have a detrimental effect on the ecosystem and therefore an indirect effect on human health and ground-level ozone and dust particles that have direct detrimental effects on human health. The impact of emissions of individual air pollutants on these environmental impacts can be estimated by using weighting factors. If we compared data to the year 1990, emissions of acidifying substances and ozone precursors decreased by 38 % and 20 % respectively by the year 2000. This reduction in emissions continued after the year 2000 with emissions of acidifying substances reducing by 54 % and emissions of ozone precursors by 19 % by the year 2007 compared to the year 2000 (Figure 3). Particulate matter emissions (primary and secondary particulate matter) were 45 % lower in 2007 compared to the year 2000. In 2007, ammonia contributed the largest share to total emissions of acidifying substances (over 95 % coming from non-energy related sectors – agriculture), followed by NOx, in Slovenia generated only by the combustion of fuel, and SO2 (16 %). 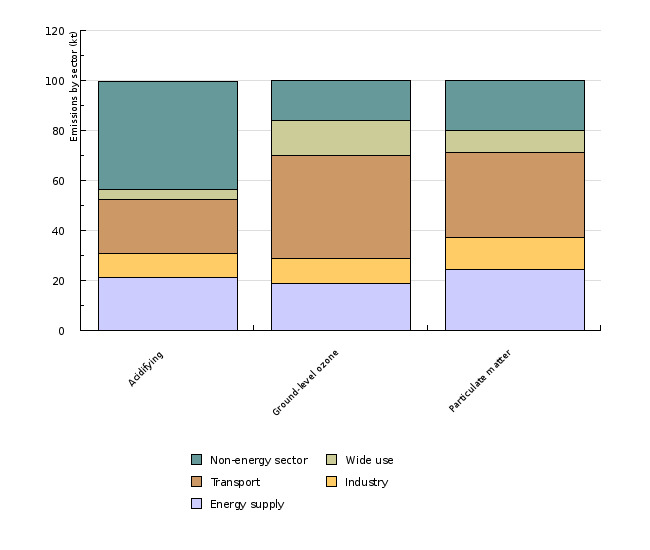 Energy sources contributed 57 % of total emissions. The weighted total emissions of acidifying substances indicate that the highest factor is that of NH3, followed by SO2 and NOx. 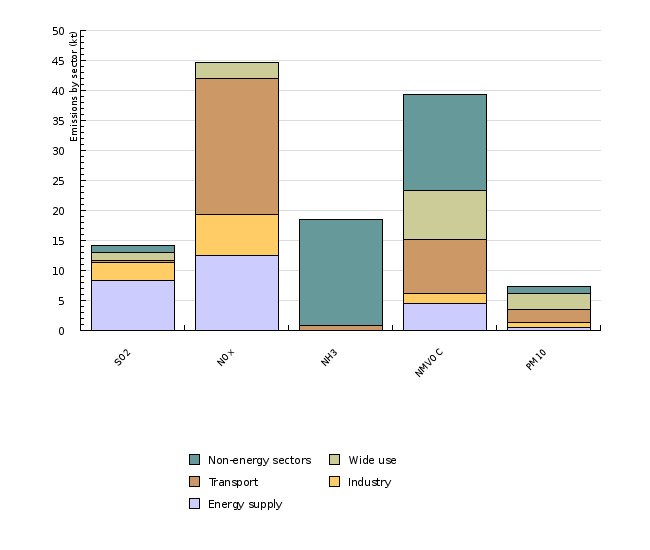 This helps us to understand the high share of non-energy related sectors in total emissions (43 %). In the 2000-2007 period, the reduction in emissions was mostly influenced by reductions of SO2 emissions from large thermal power plants and from wider use (Figure 5). 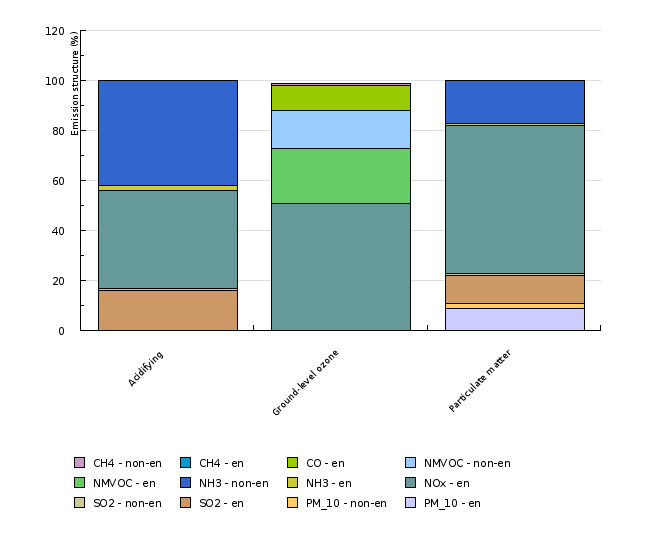 In 2007, more than half of the emissions of ozone precursors related to NOx emissions, followed by NMVOC, CO and a minimum contribution by CH4 (Figure 4). Energy sources contributed 84 % of total emissions. The highest weight in calculating total emissions is that of NOx, followed by NMVOC, with CO and CH4 weights being substantially lower (9 and 70 times lower respectively). It is for this reason that changes in total emissions are similar to changes in NOx and NMVOC emissions. The main source is transport. Contributing pollutants to particulate matter or dust particles emissions are SO2, NOx and NH3 that are the source of secondary particulate matter and PM10. The same as is the case with ozone precursors, the highest share in total emissions is held by NOx followed by NH3, SO2 and PM10 (Figure 4). Again, the majority of emissions relate to transport. In 2007, energy sources contributed 80 % of total emissions. The reduction in emissions is predominantly due to reductions in SO2 emissions. As regards environmental impacts, the common point for all emission groups is NOx. It holds the largest share in emissions of ozone precursors and particulate matter emissions (51 % and 59 % respectively) and is only slightly behind NH3 (by 3 percentage points) in emissions of acidifying substances. This allows us to conclude that a reduction of NOx emissions efficiently reduces all of the above mentioned adverse environmental impacts. The continued reduction of these emissions in 2007 is therefore very positive, the question however remains about trends for 2008, as statistical data on energy consumption for 2008 indicate a substantial growth in the sale of motor fuels in transport as well as the sale of fuel oil in wider use. In order to continue improving air quality, measures determined by both the Operational Programme for Complying with National Emission Ceilings for Atmospheric Pollutants as well as the Operational Programme for Limiting Greenhouse Gas Emissions by 2012 will have to be implemented, especially in the field of transport. An analysis of the implementation of the Operational Programme for Limiting Greenhouse Gas Emissions by 2012 has shown that the implementation of measures is unsatisfactory especially in the area of transport. Source database or source: Official data on emissions of air pollutants were used as sent on 19 February 2009 to the United Nations and as located in the Central Data Repository (CDR) under Slovenia/United Nations/UNECE – CLRTAP air emission inventories/2009 Report: CLRTAP SLO 1980–2007/CLRTAP SLO 2009 Submission (1st submission), and GHG emissions as sent on 15 April 2009 to UNFCCC and as located in the Central Data Repository (CDR) under Slovenia/United Nations/UNFCCC – UN Framework Convention on Climate Change data/UNFCCC – GHG Report 2008 (1986–2007 data).